A cyber café, or Internet café, affords users a site to browse online or complete projects and other tasks requiring a computer. Uses at these establishments can range from completing job applications to entertainment. In fact, some cyber cafes have experienced legal and political backlash due to actual or perceived gambling activities. Our cyber cafe assistant job description highlights, in addition to the duties, skills, education, and experience needed, the challenges to the future of cyber cafes and their effects on job seekers. What Does a Cyber Cafe Assistant Professional Do? As the name suggests, cyber café assistants help users with questions or problems in using the Internet or computers at the establishment. They also oversee the delivery of services and ensure user fees are collected. In some establishments, these attendants may also prepare and serve simple beverages or snacks. Help customers with the use of computers and applications. Respond to customers who encounter error messages from accessing sites, emailing or downloading content. Assist customers with downloads, printing, and encoding. Monitor use of computers to ensure compliance with café policies and applicable laws and regulations. Troubleshoot hardware, terminals, software and connectivity issues. Track customers’ time at computer terminals. Report improper or illegal use of supervisors or law enforcement as required by law or company policy. Fill orders for food or beverages. Clean computer areas and eating tables. Promote computer or Internet-related products or services. Computer Skills. Cyber café assistants need skills in keeping users connected to the Internet. This includes logging into and maintaining the café’s network. The ability to use email, word processors and applications that track usage and orders are also part of the cyber cafe assistant job description. The necessary skills to be able to spot possible reasons for improperly functioning hardware and software is also in the cyber cafe assistant job description. Coordination Skills. For cyber café assistants who serve food and drinks, necessary skills include handling cups and plates, sometimes multiple orders on a tray. Assistants must ensure that beverages, especially coffees and other hot selections, have lids securely placed and are delivered carefully to the customers. Customer Service Skills. Cyber café assistants must respond promptly and courteously to users who may become frustrated with errors, complications or slow Internet speed. Customer service includes correctly and successfully filling orders, explaining computer use policies and accurately informing users of wait times for terminals. Persuasion Skills. In some settings, in the cyber cafe assistant job description also enters selling computer items or internet service plans. To generate sales requires the ability to persuade potential customers of the benefits of the technology or service. Cyber café assistants generally do not obtain their jobs through formal educational programs. However, certain classes and work experience afford them the experience and skills necessary to attend to guests and users of these establishments. Having a blend of computer, technological and customer service skills through school and on-the-job experience can help job seekers pursue cyber café roles. Generally, cyber café assistants should have at least a high school diploma. For some employers, a candidate with at least post-secondary coursework in computer science or applications such as emails, spreadsheets or word processors may become a hiring priority. Whether from high school or beyond, a cyber café assistant needs some computer classes or training using the Internet, social media applications, spreadsheets, email and word processors. Assistants who may serve food may need training in food preparation. Depending on the location, they might be required to obtain a certificate in food handling safety. Some classes in sales and marketing may equip candidates for the sales aspects of the position. Cyber café assistants should bring some prior experience in jobs that involve computers or technology. These may include sales or clerk positions in retail computer stores, wireless phone stores or in customer service with internet service providers. Jobs as administrative assistants, data entry clerks, library assistants or typists also involve the use of computers. Volunteer work tutoring children, youth or adults in using computers affords valuable experience to present to employers. Some employers may prefer applicants with sales experience. Cyber café assistants seeking jobs with cruise ships or in tourist areas may need a work history of having worked on cruise ships or in the geographic area. Cyber cafes typically open during daytime to late evening hours. Some establishments operate on a twenty-four-hour basis. Thus, shifts can run at virtually any time period of the day. Assistants can also expect to work evenings and weekends. Many establishments may offer part-time positions. On cruise ships, cyber café assistants may spend at least a week to two weeks away from home at a time. The days are spent at sea and at destinations along the cruise path. The health of the cyber café sector in the United States faces various challenges. In many places, cyber cafes have been attacked by legislators and regulators as Internet gambling establishments. As a result, many jurisdictions have severely limited, if not eliminated, the prizes users can win for using computers or playing games. The restrictions should not apply where the Internet café serves nongambling purposes, such as allowing browsers to research for academic, entertainment or general information purposes. In some cafés, users can play online video games legally so long as no prizes are offered or awarded. Aside from legal questions, cyber cafes in the United States must compete with the wireless device industry. With smartphones and tablets, users can shop, find information, play video games or otherwise receive entertainment without resort to cyber cafes. For those who can’t afford wireless devices or to pay for wireless services, public libraries can afford Internet access. The best prospects for cyber café jobs appear to exist outside of the United States, such as on cruise ships or foreign countries. There, wireless technology may not have taken hold to the point of allowing widespread wireless device use. Those who work as cyber café assistants may find jobs as computer or technology managers for cruise lines or in full-time consumer sales. 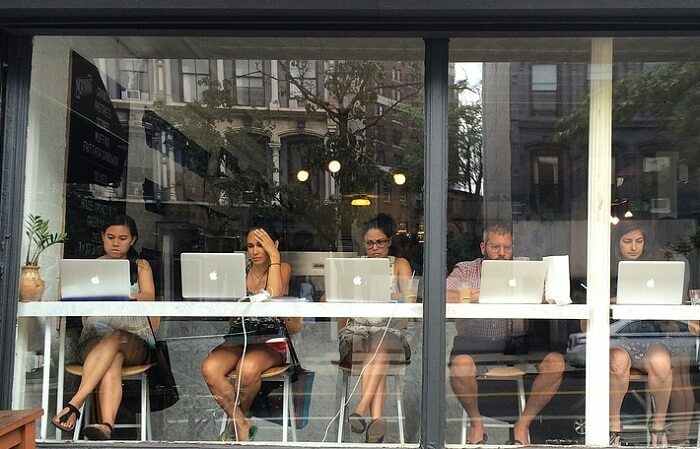 The dominance of mobile Internet technology and regulatory pressures have eroded the popularity or consistent viability of cyber cafes in the United States. As a result, cyber café assistant jobs may prove less available in the country. The best prospects for work appear to be in foreign countries or areas with less-developed wireless infrastructure. Where cyber café assistant jobs do exist, applicants will need to demonstrate solid customer service and technology acumen.